Our next Taccia ink is Aka Red. Red inks are a hard note to hit. Some are too bright, some are way too dark and I’m starting to think I’m never going to find my “perfect” red. Thanks to Pen Chalet for sending a sample over for review. Aka Red is a bright, medium red. Usually inks look great on the Col-o-ring swab, but I really don’t like how this one swabs. It just looks odd. In large swabs there is a little bit of bright goldish-green sheen. 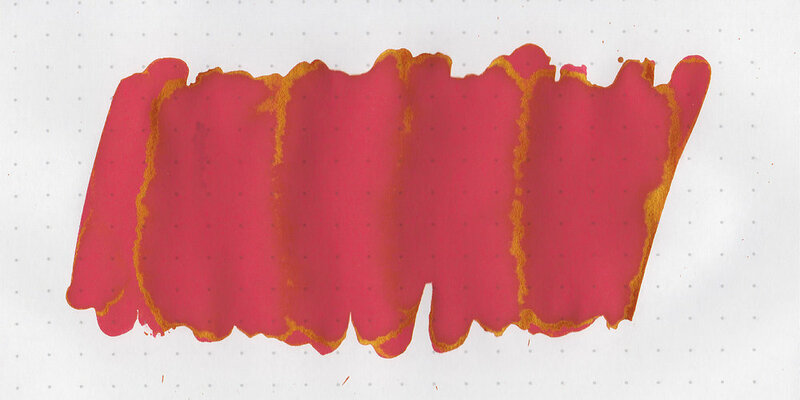 Bleeding: Low-there was some bleeding in the flex nib on Rhodia and Leuchtturm. Other properties: medium shading, medium sheen, and no shimmer. There is some medium shading, but it’s a very subtle shading, not as noticeable as some other reds have. In swabs, Aka Red is brighter than all the others, and a bit more orange. Click here to see the Taccia inks together. I used a medium Kaweco Al-Sport Red on Tomoe River 68gsm. The ink had a wet flow. Overall, I hate the way this ink looks in swabs but love it in writing. There’s a bit more bleeding than I’d like, but it’s the closest I’ve found to my “perfect” red color so far, so I definitely need a full bottle.